“The Theses are comprised of 4 major chapters and various subsections. “The first chapter engages with the developments in the international imperialist system and includes assessments on the economic-social developments in the world at the end of the second decade of the 21st century. 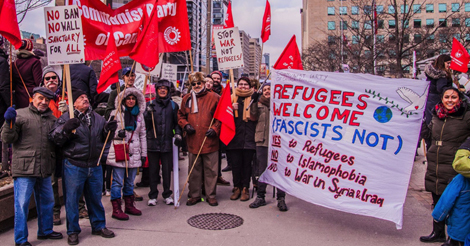 It identifies the arenas where the inter-imperialist antagonisms are sharpening, where there is an increase of local and regional conflicts and the dangers for a more generalized imperialist war in the conditions where the victims of war have increased the flows of refugees and immigrants. The adjustments-modernizations of the repressive apparatuses of the bourgeois states and their inter-state unions are being pushed to the fore on this terrain. “The second chapter engages with Greece’s position in the international capitalist system, its position inside the European Union, the relations between the national and international dimension in terms of capitalist development and the class struggle. “The third chapter concerns the assessment of today’s developments in Greece, both in relation to the Greek economy and also in relation to the situation of the working class and the other popular strata. It makes an evaluation of the government’s political line, as well as of the course of the reformation of the bourgeois political system, as this is developing, particularly over the last four years. “The fourth chapter consists of the report of work since the 19th Congress and the new tasks of the party and its youth organization until the next 21st Congress. It has as its centre the entire report of work of the four year period concerning the strengthening of the party and KNE, the axes of the party’s ideological-political intervention, the regroupment of the labour movement, the course of the social alliance. An attempt is made to more effectively shed light on the issue of the relationship between the party and movement in this report. 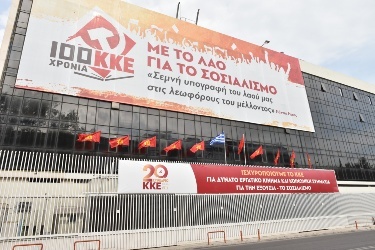 This chapter engages in particular with the course of party building, the organizational redeployment of the party forces, the issue of the cadres, the party’s finances, the situation in the international communist movement and the activity and cooperation of the KKE with other communist and workers parties in the world. There is an overall summary assessment concerning the performance of the Central Committee and the proposals of the CC are tabled for the new activities that will be scheduled for the period up to the 21st Congress. “The year when the 20th Congress will be held is the year of the 100th anniversary of the Great October Socialist Revolution of 1917 in Russia, headed by the Party of Lenin that paved the way for the working class and peoples all over the world to struggle and take power into their own hands. Irrespective of the mistakes, the weaknesses and deficiencies, of the fact that it ended in a counterrevolution and historic setback, the ice broke, the course was charted, the road opened.